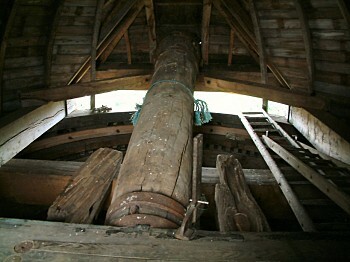 The Windshaft and Brake wheel are both situated in the Cap of the mill and both turn when the Cap is turned. 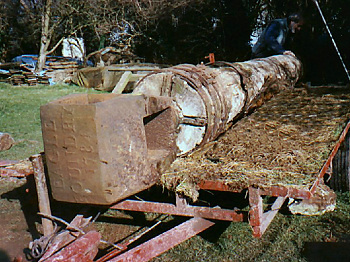 The Windshaft is a large shaft of wood reinforced by iron bands in which the metal sail boss is embedded in one end. The Windshaft is mounted into a brass bearing at a small angle off the horizontal in the Cap. The sail boss (cast by the Eagle foundry in 1784) is embedded into the Windshaft and protrudes out of the front of the cap. It is to this that the Sails are connected. The job of the Windshaft is to take the rotational motion of the sails into the cap where it can be transferred to the Main Shaft to power the mill machinery. In order to do this mounted midway along the Windshaft is the Brake wheel. The Brake wheel is a very large cogged wheel mounted midway along the Windshaft so that it stands almost vertically in the Cap. It serves two purposes. The first is to translate the horizontal rotation of the Windshaft into the vertical rotation of the Main shaft. To do this the cogs on the Brake wheel mesh with the cogs of the Wallower which is mounted on the top of the Main shaft. The second function is to provide a method to stop the sails turning. To this end the Brake wheel is surrounded by a Brake band which is tightened to grip the wheel and thus stop its rotation.